The National Office of Animal Health (NOAH) has announced the names of the winner and runner-up for the British Guild of Agricultural Journalists NOAH Writer/Broadcaster of the Year 2013 award. The NOAH-sponsored award received a record number of entries this year. First prize went to Farmers Guardian journalist Katie Jones (nee Lomas), whose article on improving herd health to boost margins was judged to have been particularly accurate, clear and of great value to readers. The judges felt Katie’s story construction, style of writing and her use of quotes were all exceptional. 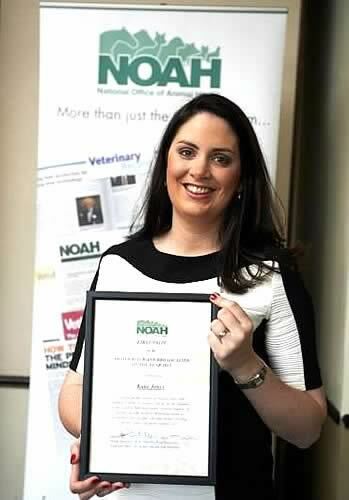 Katie said: “I'm absolutely thrilled to have won this award and would like to thank NOAH for their support of the work the agricultural press does in raising the awareness of animal health issues. Runner-up, coming a very close second, was Rhian Price, livestock journalist with Farmers Weekly, for her article on tailoring treatment plans to tackle fluke. The judges scored Rhian highly on accuracy, clarity and on the value of her article to the farming audience. The awards, which were presented at the NOAH annual dinner in London, are given to a writer or broadcaster who submits a news story, or feature, which best highlights critical aspects of animal health, welfare and management, or examines topical and relevant issues on any aspect of farm animal care. The winner receives a cheque for £750, and the runner up a cheque for £250.